Connector, antique silver-plated "pewter" (zinc-based alloy), 21x15mm two-sided oval rosary. Sold per pkg of 10. Item Number: H20-A9422FN Have a question about this item? 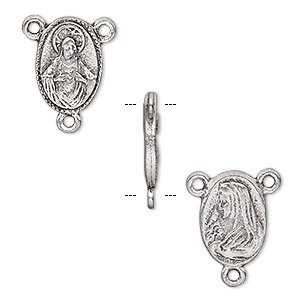 Antique silver-plated connectors are designed as rosary centers or links. Connector depicts Medal of Mary Rosary on front with miraculous medal on back. Connector, antique silver-plated "pewter" (zinc-based alloy), 21x15mm two-sided oval rosary with Miraculous Medal. Sold per pkg of 20. 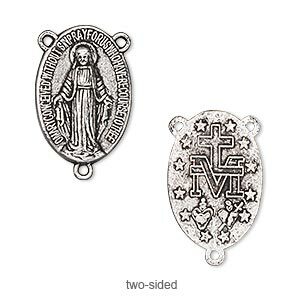 Connector, antique silver-plated "pewter" (zinc-based alloy), 16x12mm two-sided oval rosary with Sacred Heart of Jesus and Madonna with Christ Child. Sold per pkg of 10. 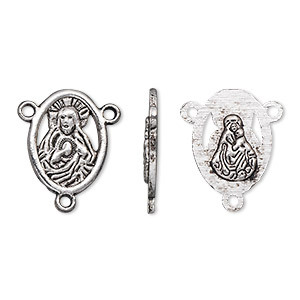 Connector, antique silver-plated "pewter" (zinc-based alloy), 18.5x10mm two-sided oval rosary with Madonna and child on front and Sacred Heart of Jesus Christ on back. Sold per pkg of 10. 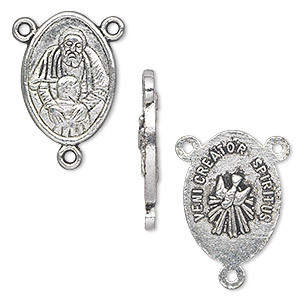 Connector, antique silver-plated "pewter" (zinc-based alloy), 20x14mm two-sided oval rosary with Prodigal Son and Holy Spirit. Sold per pkg of 10. 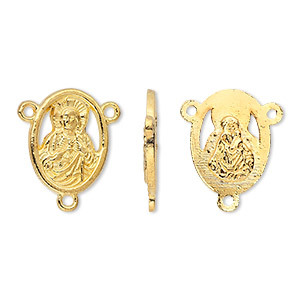 Connector, gold-finished "pewter" (zinc-based alloy), 18.5x10mm two-sided oval rosary with Madonna and child on front and Sacred Heart of Jesus Christ on back. Sold per pkg of 10. 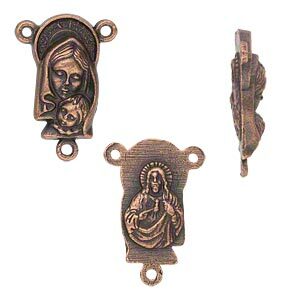 Connector, antique copper-plated "pewter" (zinc-based alloy), 16x12mm two-sided oval rosary with Sacred Heart of Jesus and Madonna with Christ Child. Sold per pkg of 10. 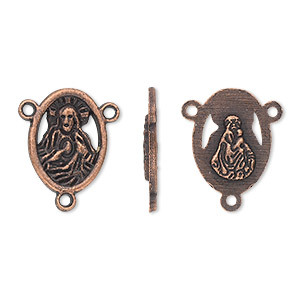 Connector, antique copper-plated "pewter" (zinc-based alloy), 18.5x10mm two-sided oval rosary with Madonna and child on front and Sacred Heart of Jesus Christ on back. Sold per pkg of 10. 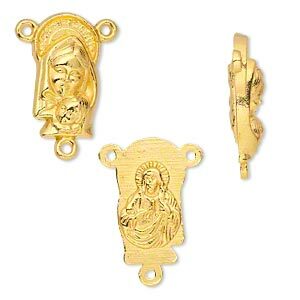 Connector, gold-finished "pewter" (zinc-based alloy), 16x12mm double-sided oval rosary with Sacred Heart of Jesus and Madonna with Christ Child. Sold per pkg of 10. 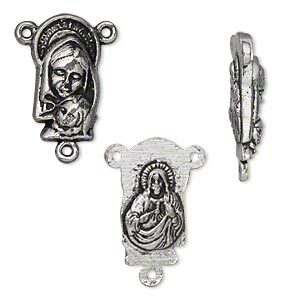 Connector, antiqued pewter (tin-based alloy), 13x10mm double-sided oval rosary with Virgin Mary. Sold per pkg of 2. 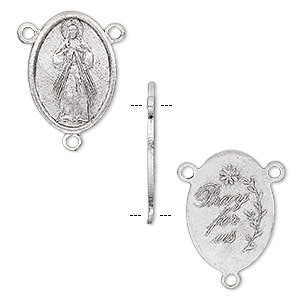 Connector, antiqued pewter (tin-based alloy), 23x16mm double-sided oval rosary with Virgin Mary and "Pray for us." Sold per pkg of 2.